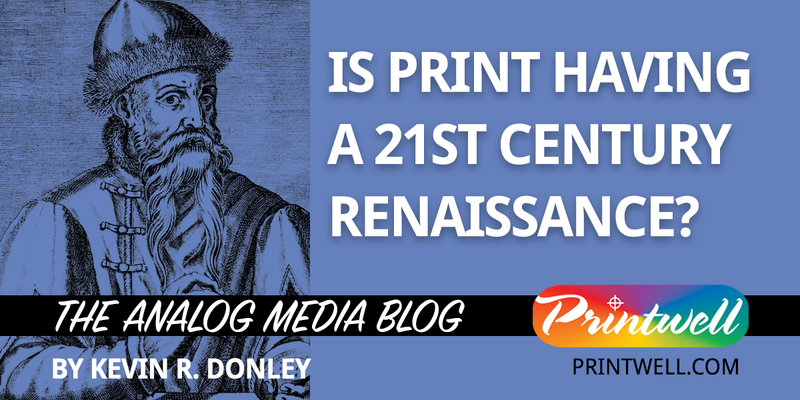 As we begin the new year and look back on 2018, it is becoming more and more evident that print is having something of a twenty-first century Renaissance. Several recent studies and reports show that print media—especially printed books—have been growing and that this trend will continue into the future. Continuing an expansion that began in 2013, printed book sales went up again in 2018 by 2%, according to data published by Neilsen in the UK and NDP Group in the US. 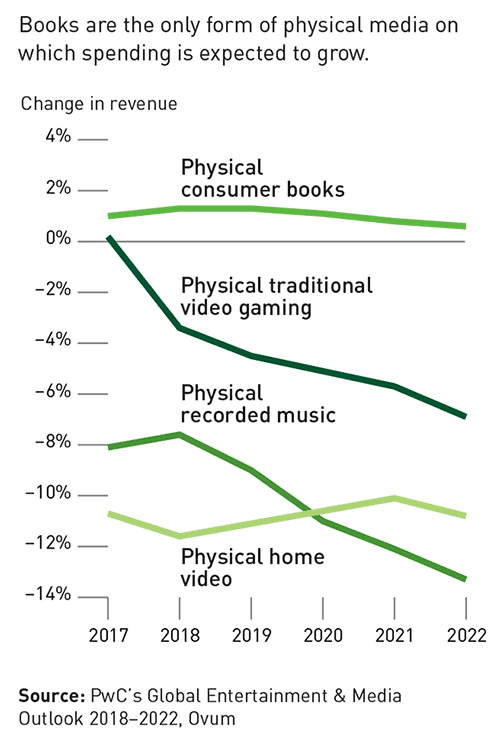 Unlike other forms of physical media such as video game discs and recorded music, sales of printed books is expected to continue growing through 2022, according to PWC’s Global Entertainment & Media Outlook. Independent books stores have grown more than 40 percent between 2007 and 2018, according to Harvard University researcher Ryan Raffaelli. After falling by 10% in 2017, e-book sales dipped another 3.9% through September of 2018, according to a report from the Association of American Publishers. Some analysts are referring to these trends as “Gutenberg’s Revenge” since they contradict the conventional wisdom about the displacing impact of digital media. It seems that Johannes Gutenberg—the fifteenth century inventor of Renaissance-era print technology that made the monastic scribes obsolete—is having the last laugh on predictions about the imminent death of ink-on-paper in the age of the Internet and electronic publishing. According to a report by AuthorEarnings.com, the growth of printed book sales comes entirely from one company: Amazon. While the number of independent book stores has increased, the volume of printed book sales by all other retail establishments combined is actually declining. According to several reports, interest in local bookstores has been spurred on by the communities around social media platforms such as Instagram. Clearly, there is something unique about the experience of reading a printed book that cannot be replicated with digital technologies. At this time, e-readers and e-books have not displaced print as rapidly as previously predicted, despite the advantages of portability, size and weight. 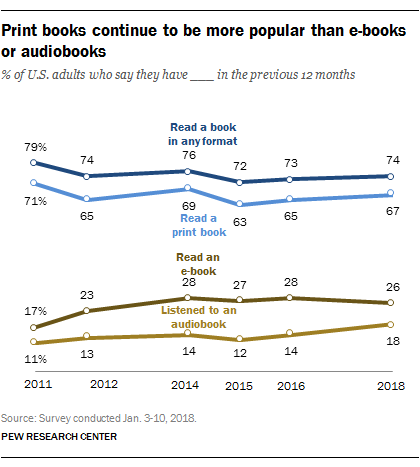 According to a 2018 Pew Research study, Americans enjoy reading a print book two-and-a-half times more than reading e-books and nearly four times more than listening to an audio book. It is also no accident that just when online information and especially social media have credibility problems, print is seen increasingly by the public as more authentic, trustworthy and reliable. Physical and paper-based marketing material, journalism and information are an absolute necessity in every marketing and communications strategy. Does the current Renaissance of printing herald a return of ink-on-paper to its glory days? This is not likely. However, it does point to print’s enduring relevance and unique value in today’s content driven marketing and communications media mix. At Printwell, we are committed to keeping our customers informed about the trends within the print media markets. Please contact your account representative for a consultation or send us a message here and someone from our sales team will get in touch with you. ← Why buyers of print media should use a G7 Master Qualified Printer?